Structural Geology: the study of the three-dimensional distribution of rock units with respect to their deformational histories. The primary goal of structural geology is to use measurements of present-day rock geometries to uncover information about the history of deformation (strain) in the rocks, and ultimately, to understand the stress field that resulted in the observed strain and geometries. 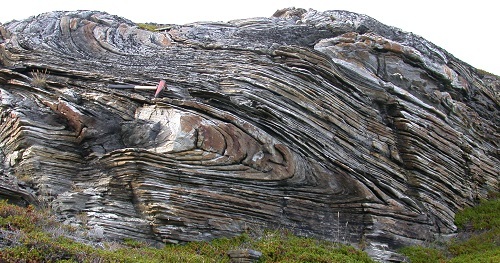 This understanding of the dynamics of the stress field can be linked to important events in the geologic past; a common goal is to understand the structural evolution of a particular area with respect to regionally widespread patterns of rock deformation (e.g., mountain building, rifting) due to plate tectonics. There are currently no items matching "Structural Geology".